Occupation Captured: Photos of Palestinian Life and Israeli Occupation in the West Bank City of Hebron. Pictured here: Waving Palestinian flags alongside flags with a key – a symbol of the right to return – hundreds of Palestinians gathered to peacefully demonstrate. When the Nakba, meaning “catastrophe,” occurred in 1948 many Palestinians fled their homes, locking their doors behind them and taking their keys. They expected to return. To this day, they are denied their right to return. Pictured here: Due to exams, schools closed at different times this week. On this particular day, nine Israeli soldiers came out from the checkpoint in response to some boys throwing stones. The soldiers continued moving further and further into this Palestinian neighborhood and shot 24 stun grenades and 21 tear gas canisters. During a brief lull, these children, just released from class, ran towards their homes to escape the lingering tear gas. Over the course of two hours, several schools closed and we monitored many children crying from the tear gas and retreating several times as they attempted to leave the area. 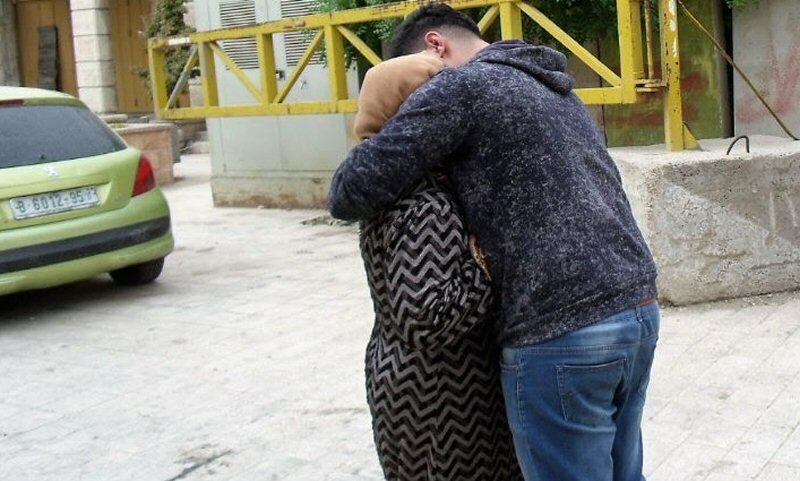 Pictured here: A distraught Palestinian mother is comforted after she sees her son arrested and taken to the military base in the Old City. Earlier, Israeli forces dragged the young man out of his family’s car while they were on their way to the hospital. The soldiers immediately tied his hands, but cut the cable after his mother protested vehemently. Families in the Old City endure constant harassment by Israeli forces who arrest Palestinians often for no reason. Pictured here: As is typical on Saturdays in Hebron, a large group of Israeli settlers invaded the souk with fully armed Israeli military escorts. As the group moved through the Palestinian neighborhood, settlers sang and shouted loudly. The incursion does not occur at a regular time on Saturdays, leaving many Palestinians uncertain when their day will be disrupted.